Melbourne's falling newspaper standards leave me feeling "depresso"
That's a pic of me, back in wintry Germany, drinking a nice warm white mocha at Starbucks Viernheim. "A long black day at Starbucks". Get it? Because a long black is a type of coffee, but "a long black day" also means that Starbucks is having a tough time. Clever huh??? Not! We were cracking up yesterday reading the papers over breakfast. It seems that people are paid to write what is essentially the journalistic equivalent of a dad joke. 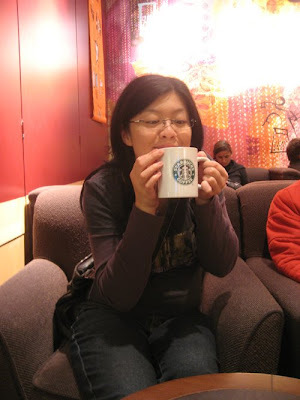 More Starbucks-related articles available here. I made these cupcakes last week, as a result of 2 things: sour cream left over from Mum's birthday party, and our friend Justin having a big ol' movie night at his house. I wanted to make something nice to take over, so I thought that Nigella's old-fashioned chocolate cake (in cupcake form!) would fit the bill. I've made this once before, in normal-cake form, and wasn't a huge fan, but I thought I might have more luck this time. ... and then dolloped into muffin-tins with an ice-cream scoop. My only advice here is not to fill them too high (anywhere between half and three-quarters seems about right), as they rise quite a bit. I taste-tested one (I am all about the quality control), and - wow - they were awesome as cupcakes! Soft on the inside, crusty outside. I think they're better as cupcakes because it tends to be a bit stodgy as a whole cake. Anyway, my brother ended up taking the plain cupcakes over, and they seemed pretty popular. I think they're definitely moist and sweet enough not to need any extra icing. For some reason, without any icing, everyone thought of them as muffins. hey sarah! thanks heaps for the muffins last night! they were awesome! shame u couldnt make it! oh well, next time! Two weeks ago, I was inexplicably hit by an intense craving for a bacon sandwich. (General bacon cravings being a rather normal occurrence, I'm afraid). It started when I had a BLT at work on my break. I carefully removed the bacon from the sandwich, and grilled them separately, thus maximising the bacon crunch factor when both sandwich and bacon were, joyfully, reunited. There was lettuce, there was melted cheese, there was tomato, there was toasty bread, there was mayo and there was crunchy bacon. Good lord, it was good. But after that, I couldn't get the idea of a pure bacon sandwich out of my head. The type I read about in Nigel Slater books, the type that 'ard bastards eat in English cop shows - soft white bread, butter, bacon fat, crispy streaky bacon. I went so far as to do some internet research on the topic. It seems that there are people out there who are absolutely passionate about bacon butties. (Butty is a Northern English word for sandwich. You could also say "sarnie", but I am a big fan of alliteration). According to a scientific study (no joke), an integral part of a successful bacon butty is the aural factor - i.e. how loud the crunch is when you bite into it. So, a couple of days later, I decided to have this treat for breakfast. I bought myself the whitest-of-white breads: a white bap from Baker's Delight. I looked for streaky bacon, but couldn't find any at my local butcher or supermarket. I think that health consciousness is really on the up-and-up. I ended up "settling" for some lovely free range, non-hormoned lean bacon from a fabulous local butcher. I wouldn't get too precious about it either way though; I hardly think that the original versions of these sandwiches, served in greasy spoons all over the UK, include such distinguished bacon. But I digress. I fried said bacon in my black steel pan, spread some butter on the inside of the bap, and (oh dear) used the bread to mop up the pan juices once the bacon was cooked. I wasn't even hungover. What can I say? It was a strong craving. As you can imagine, it tasted great, but even halfway through I'd developed a slightly sick feeling in my stomach. This was the least healthy breakfast I could have had, and I don't recommend that it be eaten on a regular basis by anyone who values the use of their arteries. As a once off, however, it seemed ok. And it totally killed my bacon butty craving. The next day, I was back on my usual porridge breakfast with great enthusiasm. What is it they say about needing to hit rock bottom before turning your life around? 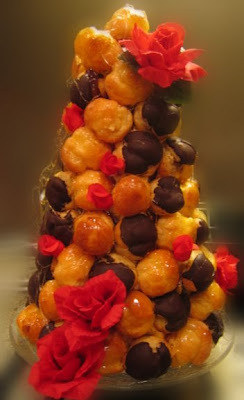 The finished croquembouche. After all the day's dramas, I was so proud and relieved to have completed it! I may have even done a little happy dance once it was safely on the table. See all the little caramel threads? 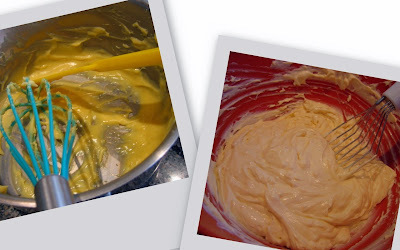 They actually built themselves as I was building the 'bouche - as I transferred my tongs from the pot of caramel to the cone and back again, and rotated the plate, the little threads of caramel would follow the trail. Cool, huh? 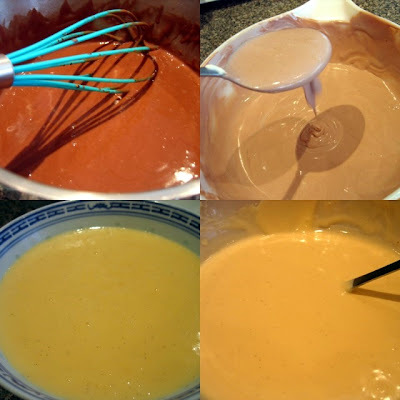 After the whole 'bouche was finished, I added a few extra caramel threads - using a teaspoon to drizzle the caramel over the cone. From left - raspberry/blueberry frangipane tartlets, the croquembouche, madeleines. Cheese 'stars'. I had a few bowls of these dotted about the place. Union Square Cafe Bar Nuts. I had 3 bowls of these in various places around the house. I had planned on buying olives, but we ran out of time that day. I don't think anyone missed them though. Pumpkin and Bocconcini Skewers - I'd over-roasted the pumpkin and it was quite soft (whoops), but we managed to get a decent number of skewers. Phew. The chillies ranged from mild to very, very hot. Bread rolls ready for sausages. Quiches ready for anyone who was still hungry. The cheese platter. Clockwise from left hand side: cornichons, muscatels, Brazilian guava paste, Bergader BlouBayou Cheese (it's German! ), Double Brie, Cheddar. 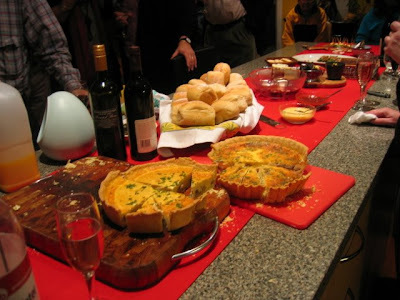 The cheese platter and quiches stayed on the table, whilst the skewers and beans were passed around. We had oysters as well, but I didn't manage to get a photo of them. As the menu had stated, we were supposed to have cooked prawns, but when my bro went to pick them up, they were raw! Whoops. I didn't have any time to cook them, so I stashed them in the freezer, and we'll have them for a treat sometime this week. Gruyère Cheese Choux Puffs - I reheated these in a 180C oven for about 10 minutes and then passed them around. 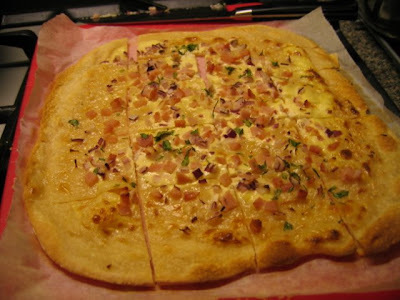 Flammkuchen - bacon flavour. I made 2 bacon and 2 chicken, and these were surprisingly very popular! My cousin Jacob did a super-job of passing this around. Thanks Cuz!!! 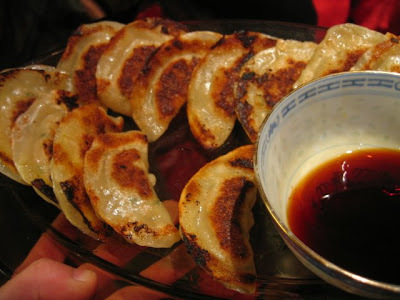 She started frying/steaming the gyoza as I was onto the second round of flammkuchen. Man, it was smoky in the kitchen! 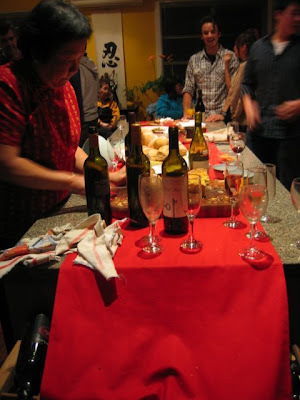 And it was also very crowded in the kitchen, so it was a bit of a challenge co-ordinating the pans and knives and boards and food amongst all the guests. But still fun. By this stage, all I wanted to do was crawl into bed and and sleep; my throat was killing from yelling to talk to everyone over the hubbub. And because I was sick, food just wasn't looking appealing to me. I cooked 1.5 kg of beef chipolatas on the stove, but I seriously couldn't imagine anyone wanting to eat more. But they did! It seems that everybody loves sausages! (All meat-eaters, that is). They were wolfed down ravenously. 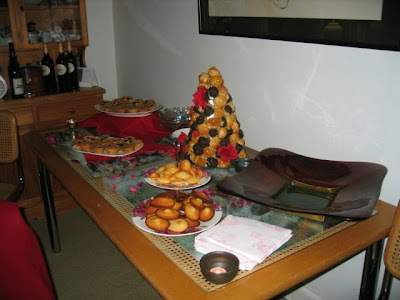 At about 9, we moved into the lounge-room for dessert! I should mention now that over the course of the evening, a couple of balls had fallen off the cone - we'd had a few candles nearby which I think were slowly melting the caramel. But we moved the candles out of the way and the other balls remained firmly stuck onto the cone. Phew! Sparklers on the 'bouche. Shh... don't tell anyone, but one of the polyester flowers caught on fire! I just picked it up and my mum and I blew it out, hee-hee! After singing happy birthday, we passed the balls around on napkins. I was surprised that so many people really liked them. 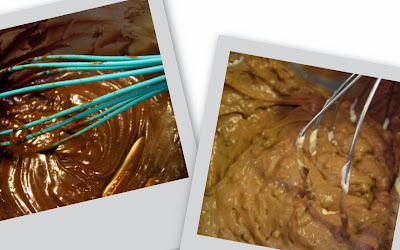 Did you know that profiteroles are a super-popular dessert? I should totally add them to my dinner-party-dessert repertoire. So, the party was a lot of fun. I've never seen my house this crowded before! We made only a bit too much food, and bought way too much alcohol. We've got heaps of drinks leftover! My parents had a great time, and people seemed to stick around quite late, which I assume means they were all having fun. I think a couple of people were having a bit too much fun... but that's all part of the party atmosphere. (Yelling out at me, "Chef! Where's your wine glass?!?! Drink more!! Meet my son!") I should add here, that I was beaten by my lovely cousin Catherine, who had TWO fathers interested in introducing her to their sons. I suppose it's a hazard of attending inter-generational parties. My bro was awesome DJ for the night, mixing up a great selection of R&B and chill-out songs, and pulling out the Stevie Wonder for cake time. Stevie rules! 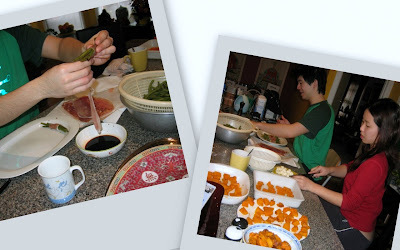 A big thank-you to my parents for letting me take control of the kitchen, to Dad for paying for everything and setting things up beautifully, to Su for her awesome gyoza and incredible help, and to Dan for DJ'ing and transportation! And the biggest thank-you to Mum, for being the best mum in the whole wide world and looking so lovely on her special day.